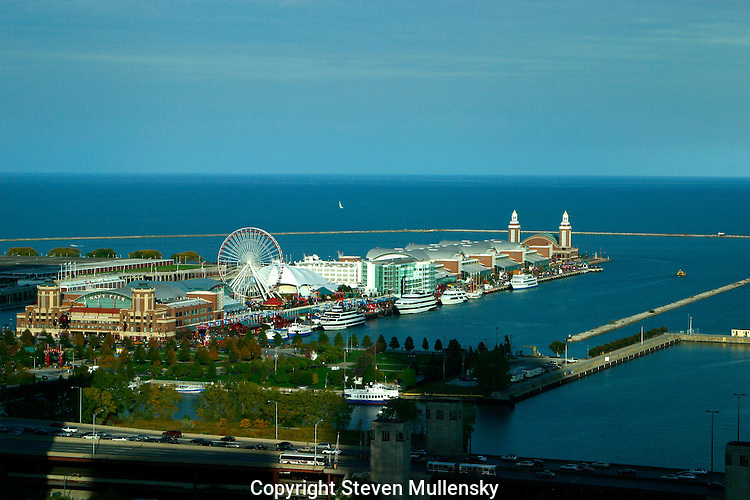 Navy Pier is a 3,300-foot (1,010 m) long pier on the Chicago shoreline of Lake Michigan. The pier was built in 1916 at a cost of $4.5 million; it was a part of the Plan of Chicago developed by architect and city planner Daniel Burnham and his associates. As Municipal Pier #2 (Municipal Pier #1 was never built), Navy Pier was planned and built to serve as a mixed-purpose piece of public infrastructure. Its primary purpose was as a cargo facility for lake freighters, and warehouses were built up and down the pier. However, the pier was also designed to provide docking space for passenger excursion steamers, and in the pre-air conditioning era parts of the pier, especially its outermost tip, were designed to serve as cool places for public gathering and entertainment. The pier even had its own streetcar. It was known as a romantic spot for young lovers.